‘Do ladies have mid-life crises?’ asks newly 36-year-old Nadia Vulvokov (Natasha Lyonne) at her colourful birthday party in New York. Leaving with an academic who sleeps with his students, she’s run over by a taxi and immediately killed… only to wake up at the party again, like her life’s been rewound. And now, every time she dies, her world resets to the exact same time and place: looking at her reflection in a bathroom mirror. 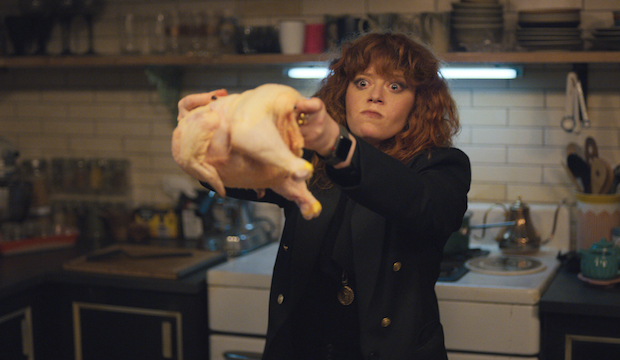 This is Russian Doll, a new comedy series from Netflix that’s been released with very little hype – despite really deserving it. Starring and co-created by Natasha Lyonne from Orange is the New Black, it’s already won us over. Here's why you need to watch it. We’re flummoxed firstly by Nadia’s dark and abusive sense of humour. She comes out with some excellent one-liners, especially under pressure, and this only exacerbates in her current time-looping situation. When she spells out her surname for a couple of doctors, she remarks: ‘it’s like “Volvo” but with more letters and dyslexic’. Lyonne plays Nadia with naturalism and exaggerated comic timing, which is a difficult and contradictory balance to get right. Her performance is like a controlled improvisation, keeping her character in a constant state of spontaneity. But there’s an emotional side buried beneath the witty defence mechanisms. Her general pessimism is infectious, and grows only more destructive as she’s forced to relive that endless night over and over again. The series is also funny in its confusion. As the time-loops become increasingly tangled, it’s hard to figure out what’s going on. Nadia tries to explain her bizarre situation to Maxine: ‘I think a guy who gave me a haircut yesterday may’ve died tomorrow, and I don’t know how tomorrow-deaths work when it’s yesterday again’. Much like The Good Place, yet with completely opposite vibes, the confusion is part of the fun. Similar to other bitter-sweet Netflix comedies like BoJack Horseman, there are a few episodes of pure comedy before whacking us with its heartbreaking, emotional core. This resides mostly with Nadia’s relationship with her abusive mother, who died years before. She's mentioned at the start of the series (‘Maybe she would’ve been pretty excited that I was actually finally older than she ever was’), but her memory is gradually drawn out with each episode. Nadia's repressed feelings and anxieties are pulled to the foreground, and it's sometimes painful to watch. And with the very concept for Russian Doll, the air is thick with existential repetitiveness. The same things happen, the same people pop up, offering the same reactions in more-or-less exactly the same way. It’s almost a reaction to the mundanity of her day-to-day life, the time-loop acting as a kind of anxious crisis. Her 36th birthday, riding up to the big 4-0, could be the cause of all this – as well as a catalyst to cure it. We watch as, in a similar way to Groundhog Day, Nadia tries to adjust the mistakes in her life. But is that worth doing, if she’s going to die again and return to the start? Like the surreal novels of Haruki Murakami, Russian Doll kicks off with a missing cat. For reasons unknown, Nadia’s cat ‘Oatmeal’ has a strong part to play – namely the reason why she first died. Perhaps it’s the only comfort in Nadia’s life, like Llewyn and Ulysses in the Coen Brothers’ Inside Llewyn Davis. The surrealness of the series is in the time-hopping, which she tries desperately to understand. Is it drugs? Or mental health issues? Or a purgatorial punishment? The series crafts a psychological undercurrent, much in keeping with Nadia’s repressed feelings from her tortured childhood, with unconscious fears slowly rising to the surface – sometimes feeling like a David Lynch film. Episode 7 is key to this kind of emotional surrealism, reaching horrifying heights as Nadia tries to come to terms with her turbulent past. Russian Doll is scary as much as heartbreaking. Some may be baffled and frustrated by Russian Doll, but we think it’ll grow into a cult comedy classic. It’s an inventive, funny, and sometimes crushing journey. And with episodes that average a length of 25 minutes, it’s a seriously easy binge-watch.